Reinforced by their new recruits and their summer release, Samson Sounds are ready to return home to Eden. Find them on the Devorgilla Main Stage, Sunday 2:30pm-3:30pm. The instantly noticeable thing about Samson Sounds gigs is the mob of followers gyrating in the front few rows. Leaving healthy space to move, their fans weave around each other to the band’s infectious rhythms. Their residency at Eden’s Fury Chillum stage for the past six years has acted as an annual meeting point for Samson Sound heads to regroup before the band inevitably branch off to explore new terrain. This year much is changed. They will be at a different Eden stage, the band have a new dynamic and their productions have a new sound. 2011 was the year Samson Sounds played their first show at Eden, it took place in a hidden away geodome on a sound system powered by bike pedaling. Anders Rigg tells me this on the phone as he jumps off his own racer and onto the next stage of his journey towards Knockengorroch festival. 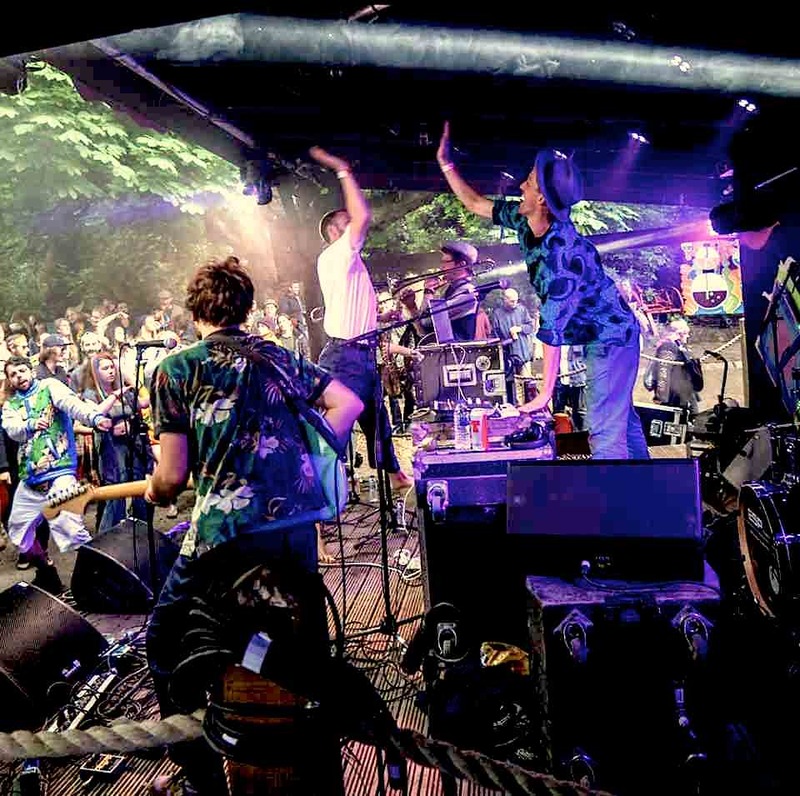 At this year’s Eden, Samson Sounds will be on the main Devorgilla stage where they have played once before in front of a sea of raised trainers and their skanking mob chanting ‘shoes aff!’. Anders, the engine behind the drum machines, is clear about how to bring a band from bicycle power to Eden’s biggest main stage generator: the band consistently add new elements and challenges to their work. In their latest release, Jumbo Rush, stricter time restraints were placed on the recording and production processes than their previous projects. Despite this, they collaborated with international and local acts and jumped from studio to studio to release a diverse EP primed for summer listening. On Jumbo Rush the band take from international skies and local soils. Longfingah, an MC from Berlin, came through to their studio in Lochwinnoch to feature on the track ‘One World’, creating a special bond between long time admirers and an established face in the German reggae scene. Anders says Longfingah was inspired by the close knit, well-organised and relaxed nature of Glaswegian dub culture. Old friend of the band, B-Side’s input may best portray these elements. Since Samsons and B-Side started collaborating, she has gone from singing behind a table in order to hide from the audience to standing up and belting out in front of a 600 people-strong London crowd during their recent tour. “She is reaching new levels.” Declares Anders. Local vocalist Breezy Lee also stepped into the Lochwinnoch booth from that loyal crowd of Samson Sounds fans. The two female singers “bring sheer power” to the bands set-up, according to Anders. On ‘Witness’, a hip-hop breakbeat lays the foundations for the soulful vocals of Breezy Lee and the warbling brass of Duncan Mark Horne’s saxophone and Roger Marsh’s trombone, recorded in Mungo’s Hifi’s studio. Then ‘Madting’ returns the listener to a “progression of the Samson’s soul”, with twinkling guitars and heart-racing claps, Willy Greensmith on leading vocals and guitar in a track that will undoubtedly create chaos on the Eden dance floor. Yet it is ‘Soundbwoy Head’ on Jumbo Rush that reveals the true rumbling energy that currently surrounds the band. The glistening introduction that subsides into a growling rendition of “Jumbo rush, jumbo rush”, parades the serious tone that Samson Sounds are now capable of. The band’s previous main vocalist Oz Mandias features on ‘Soundbwoy Head’ in rip roaring fashion. Samson Sounds, undeterred by nostalgia, march forward with their impressive roster of past and future collaborators. Reinforced by their new recruits and their successful experience of working across studios and within stricter timeframes, Samson Sounds are ready to return home to Eden. Time to show-and-tell the new sounds in their locker. Find them on the Devorgilla Main Stage, Sunday 2:30pm-3:30pm.